At around 11 o’clock each morning we hear the jingle jangle of goat bells on the hills above the garden. The goat herder spends all day walking them round the valley while they eat everything in their path so the trick is to not walk them over the same route until the scrub has had a chance to grow back. It’s not a bad way to spend the day, walking on some beautiful hills then home for some fresh feta and yoghurt as long as you don’t mind permanent tinnitus from the bells. Our hosts on Paros, Jim and Irini have got a great lifestyle too. Both talented craftspeople with skills in leatherwork, sculpture and jewellery they seem to be able to turn their hands to making all sorts of things. But Jim has found a good niche with men’s wedding rings and has a successful internet shop through Etsy for selling them around the world. It’s a fantastic lifestyle business that in theory he could operate from anywhere that has a good internet connection and reliable postal system (it’s debatable whether Greece offers the latter) and there seem to be a steady but manageable stream of customers interested in his work. Meanwhile when not preparing a feast in the kitchen Irini looks after the letting of the three pretty cottages that are tucked away in the garden. Popular with anyone who wants to get away from the usual holiday spots and find some tranquility they’ve had all sorts of writers, artists, dancers, yoga groups and families staying for a few days or a few weeks. If you don’t mind having to drive to the beach and not having a bar within walking distance then this is the place to come. Kirsty and I have been enjoying trying out a career in gardening for size. I’ll admit that I’ve never really had the patience for horticulture in the past as there always seemed to be something more exciting or more pressing in the diary but by removing any other distractions, and also any time constraints, it’s allowed me to see what some of the attraction is. 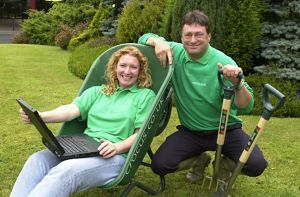 Ok, Alan Titchmarsh and Charlie Dimmock shouldn’t be fearing for their jobs just yet as most of what we’ve been doing is pulling out weeds and tidying up but that in itself can be quite satisfying. The weeds then get chopped up and mixed into the compost to then be spread back onto the beds to allow more weeds to grow. I think this is what Elton John was referring to when he sang about The Circle of Life. There’s been a bit of dry stone wall repairing which also rewards patience with some satisfaction when the stones fit together just right. Paros is covered with enough dry stone walls to surround every field in Cumbria, Yorkshire and Derbyshire but luckily I only have to work on a very small part of a very low stack of stones. Kirsty has been broadening her skill set in other ways too. She revealed to me that her childhood ambition was to become a hairdresser so I handed her the scissors and invited her to practice on my unruly barnet (but not the beard). I came away looking nearly as smart as the flower beds we’d been working on and even retained both ears so I think this could be a possible job opportunity for when we return home. Away from the garden we’ve had some time to explore a lot of the island on foot and by bike and even managed a night in the tent just to make sure we remember how to put it up and to make sure we haven’t gone soft having spent so long under a proper roof and with a proper bed. We’ve also been able to read proper books from Jim and Irnini’s extensive collection. Although the Kindles are brilliant when we’re on the road they’re never the same as holding real paper in your hands. In line with developing some patience for gardening I picked up a book called In Praise of Slow by Carl Honoré which explores the virtues of taking your time in all aspects of life. It’s an interesting read so comes recommended for anyone who spends most of their time running around like a headless chicken. It’s premise also rings true when it comes to cycle touring. Go too quick and you’ll miss the good stuff. I hope Kirsty will agree that I’m getting better at changing down a gear or two and stopping to admire the view but there’s probably a bit more work to be done before I’m fully switched out of ‘race mode’. And it’s not long before we pack up and (slowly) ship out again. We’ve bought our Turkish visas and are plotting our route to Istanbul with a view to heading North from Athens next week. Our plan to stay put while the weather starts to improve in Turkey seems to have been worthwhile as the forecast has been improving day by day further north. Hopefully it’ll continue. We could easily find ourselves staying here indefinitely but a whole new continent is waiting and besides, those goat bells are getting a bit iritating. Nice pictures and write-up. Looks like you found the ideal spot. Thanks Alex, it was a brilliant place for a break!